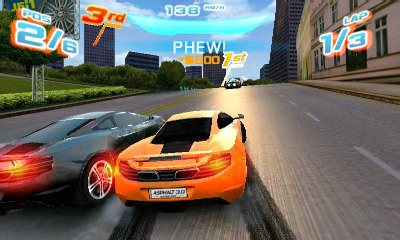 Asphalt, one of the most popular franchises, has released a new racing game for the 3DS, in 3D. But was this game actually finished? 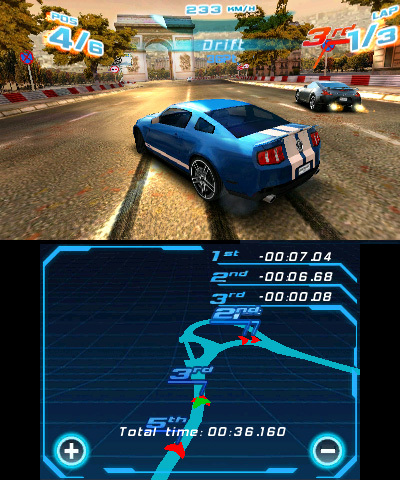 The game has a lot of content, from nearly 20 tracks and 30-40 cars, with many tune-up options for every car. 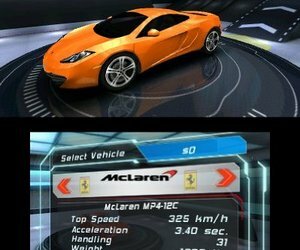 You can choose sponsers that give you special racing abilties, play additional racing modes, check rewards to see how to collect them by completing certain requirements, paint your cars, etc. You can also play this game online, but local play is it's limit. Unfourtunatly I live in an area where no one else has the game. Now onto the racing scene. There are alot of things to do, and alot of things not to do. When you start a race it begins with a little bit of narration to inform you about the track. When you start the race, you start in last place every time you begin a race. Challenging, but why always? You can grab turbo power-ups on the track, and hit the turbo for some extra speed, but don't go too fast or you wont be able to turn the car, so use this on straightaways. However, if you save-up your turbo you can use HYPERSPEED when the bar is full, which allows you to plow through ANYTHING without stoping at super high speed. The mistake they made with the turbo system is that if your turbo bar isn't full you hit the NOS button three times, you go so fast you can't turn, but in Hyperspeed you can turn like you weren't using turbo and you go faster than before. Huh? I'm starting to think this game was rushed to the 3DS. Then the car never stops shifting gears, even after reaching top speed. ??? And everytime you touch the brakes on a car it goes into a drift....? You must watch out for traffic while racing or you end up paying a huge fine, "High Speed Paint Job" - $5000. Ok, but why are the traffic cars so solid when you hit em? You hit them at 200 mph, and you stop, and they keep going? You can knock other race cars into the walls or hit them at Hyperspeed and PWN them for extra turbo, but keep up with the reckless driving and you have the cops on you. Keep on reckless driving with the cops on you and they send in more cops along with the High Speed Patrol, which use vintage sports cars to take you down. That is pretty cool, but the cops are crazy and can't drive straight for one second. Get pulled over and you may pay up to $8500 dollars. Not enjoying the fact that your car has too many dents and your windows are shattered? Grab Fix-Up Power-Ups to restore the beauty of your car. This is a cool feature, and is an incentive to fix your car every once and awhile. Pulling off tricks, like high air-time, finding shortcuts, and smashing other cars will earn you ca$h and turbo. An alternative is to hit ca$h power-ups to earn cash. This is another cool feature. Finally, you have the bonus challenges and finishing the race. Every race has certain bonus challenges, like not using Hyperspeed, don't atract police attention, etc. When you finish the race, you get ca$h for any and all acheivements you got during your race, such as getting 1st place, PWNING other cars, etc. Then, your points that you got for the race empty into a meter that upgrades your status everytime it fills up. It also gives you a new tune-up and/or car to buy. Overall, I give this game a 5 out of 10. It has somethings wrong with it making me think they rushed it, but it isn't all bad. 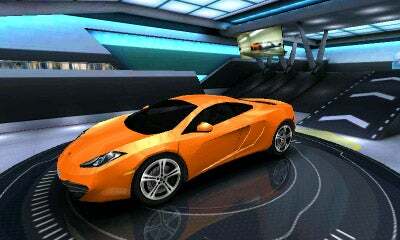 It is a good racing game. Sorry but I'd never heard of it till the 3DS launch. never knew this was real and lol a poll i gave it a 5 idk sounds kinda cool. Never played the game but the review was decent. Racing games meh other than mk7 for me, but good review. Good review, but I wouldn't pay more than $10 for this. For you, I was trying to write a review that fits for mostly everyone.